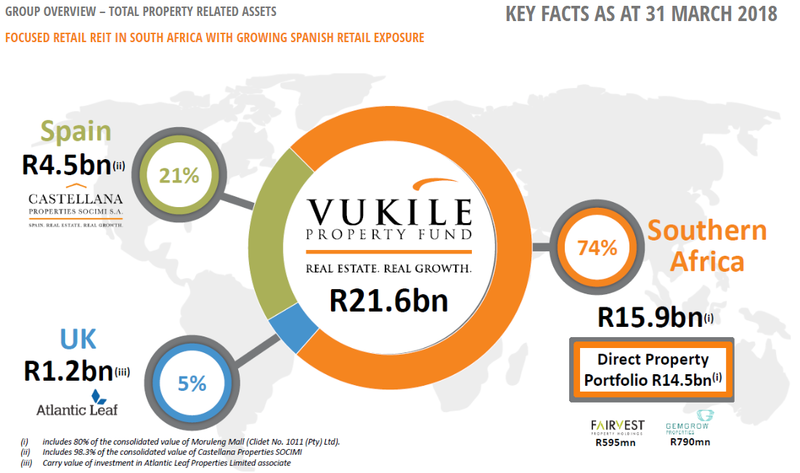 Vukile Property Fund Limited (VKE) is a JSE-listed REIT, predominantly focused on retail property. It has a second listing on the Namibian Stock Exchange and was the first property company to be awarded REIT status on the JSE, a little more than 5 years ago (1 April 2013). 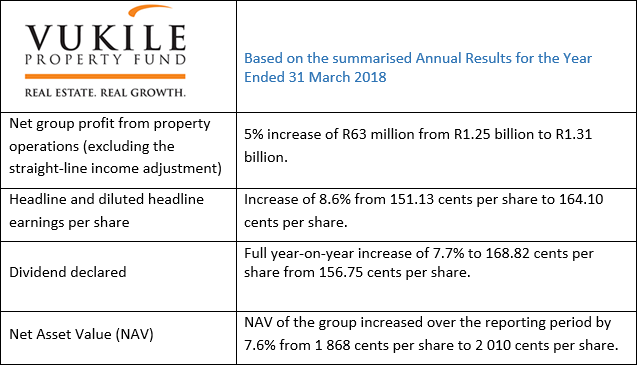 On Wednesday (30 May 2018), Vukile released its summarised year-end results for the period ending 31 March 2018. What follows hereunder is the highlights package. 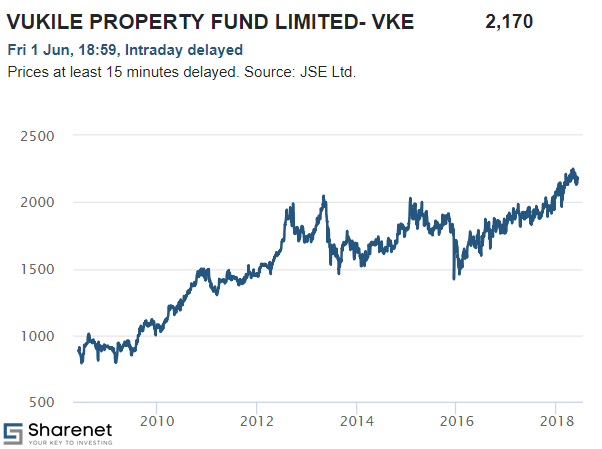 On the 31 March 2018, Vukile Property Fund’s investments were valued at R19.1 billion. This represents a 40.4% increase over the March 2017 number, which came in at R13.6 billion. A large portion of the uptick in valuation comes from the more recent Spanish acquisitions which were valued at R4.5 billion as at 31 March 2018. Acquisitions for the year across the South African and Spanish territories amounted to R4.7 billion. This significant activity was largely generated from the sale of properties (net proceeds of R175 million), the raising of debt (to the value of R3.1 billion) and the issuance of additional shares (R1.6 billion). 34.9% in Atlantic Leaf Properties, an associate, representing a carrying value of R1.2 billion. 31.4% in Fairvest Property Holdings, valued at R595 million. The results generally point to an improvement in both financial and operating metrics, with dividends for the six months ended 31 March 2018, increasing by a healthy 7.9% and resulting in a full year improvement of 7.7% to 168.82 cents per share. The net profit (available for distribution) came in at R1.31 billion, beating last year’s number (R1.12 billion) by approximately 17%. Vukile has indicated to shareholders that for the short to medium term, it will limit its international expansion to Spain only. Locally, opportunities in South Africa will still be sought, and the expectations of the board are that balance sheet metrics should remain similar to that of the 2018 financial year. On the local trading environment, the statement released by both the Chairman and CEO on behalf of the board of directors stated: "While we are buoyed by the improving political and economic climate in South Africa, and the resultant uptick in consumer confidence, we are yet to see a tangible improvement in the trading environment. As such, we anticipate another challenging year ahead, largely in line with the operating conditions we endured over the past year. We do, however, expect to see an improvement in trading activity beyond next year." In Spain, the group’s Castellana asset is set to continue growing, and the group also anticipate improved profitability in the upcoming financial year as once-off costs incurred in this year will not repeat themselves going forward. Castellana is also expected to list on the Madrid Junior Board (MAB) in July 2018, but management are not planning to raise external capital on this listing. Vukile further expects to grow dividends between 7.5% to 8.5% in the year ahead.